This guy is really pushing my buttons at the moment - and I don't mean that he is annoying me, but rather TURNING ME ON. Musically speaking, that is. Whilst the sun sits high in the sky I play this man's music and it just sounds perfect. He makes this sunny brand of sampling music, turning old sounds into new ones by chopping them up and mashing them together to create a future funk flavour. Sounds delicious right? So anyway, yeah I wrote about him before. 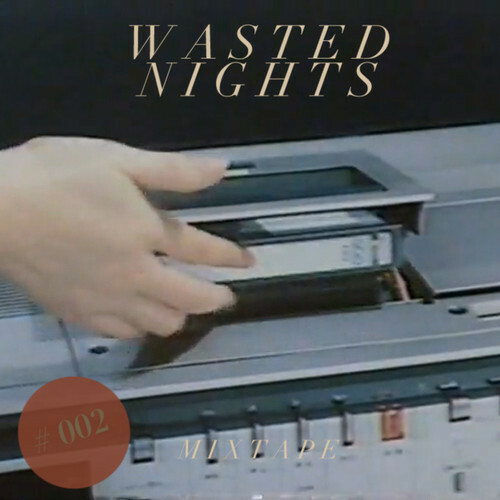 If you haven't already guessed from the title of this post, it's Wasted Nights of course. I wrote about him before, when I came across his song 'Palm' - I naturally went crazy when I first heard this, and I would've been dancing, juggling coconuts and attempting to make a tropical cocktail in every single vessel I could lay my hands on, but I have a broken knee. However, that's what my brain was telling me to do. Little did I know he made these little mixtapes as well as his own music. They give you a nice insight into his - yes; his name is George Rosolac - taste in music. Which seems to be in the same vein as his own style, looking back to a when the music was happy and when most of the world was going through an economic boom (Cold War anyone? ): yes, the 80s. I've heard people who actually lived through the 80s say that they hated it and the music was rubbish and the fashion was worse, but for me, yes for me and many others, who drew breath from the atmosphere for only a couple of years at the end of the 80s, it's an alien era filled with fun colours and fun sounds. The future was just around the corner. Then we got to the future and it's a bit troublesome - I've seen more revolutions and riots and civil wars on TV in the last 10 years than... well, than I've wanted to see. So sit back and chill out to Wasted Nights's MIXTAPE #002, maybe even download it - cause ya can - and take it with you someplace nice, play it in your car and cruise round your local town, even if it's Nowhere-on-Sea or Lower Hibbingdon or whatever, and say with all your heart: "What recession? What war?" It's gorgeous. Glitzing with muscle-bound drum machines, ice cold slap bass, infinity pool synth and soulful vocals, this medley of songs oozes the carefree, endless and unbeatable summer of youth, of fun, of pleasure, of dream-following unconquerable decisive happiness. Sun & rain, day & night, ebullient & chilled. Err... here's the track list. I've done links on em too so you also can explore the music of these artists. I hope that you enjoyed/will enjoy this. If not, then that's fine - the world would be a boring place if only ONE singular taste in music prevailed in the minds of everyone everywhere. If you did like it, you can also check out the earlier (1-month-old) MIXTAPE #001 - I hope these are monthly cause I loves em.